Create your vision with the right combination of performance reviews, goals and continuous feedback. PerformYard can be slimmed down for simple annual reviews or built up for complex performance management strategies. PerformYard facilitates any review process, across any timeframe and with custom inputs. Create your own forms from a variety of question types and track goal performance within reviews. Run different review cycles for different departments and manage any sign-off process for completed reviews. Employees should be reviewed on goals they know about. PerformYard allows you to cascade corporate objectives across the organization, and update them as business priorities change. Then track individual progress with a single glance using our clear visualizations. Effective performance management is more than a completed review; it’s a continuous dialogue to help employees succeed. In PerformYard you can document 1-on-1 feedback meetings, recognize great performance, share information with managers, or keep private notes to revisit at review time. Incorporate feedback from across the organization. Employee reviews can include self assessments, feedback from direct reports, and multiple managers or executives in the process. PerformYard also allows inputs on employee performance from people outside your organization, like clients, at no additional cost. 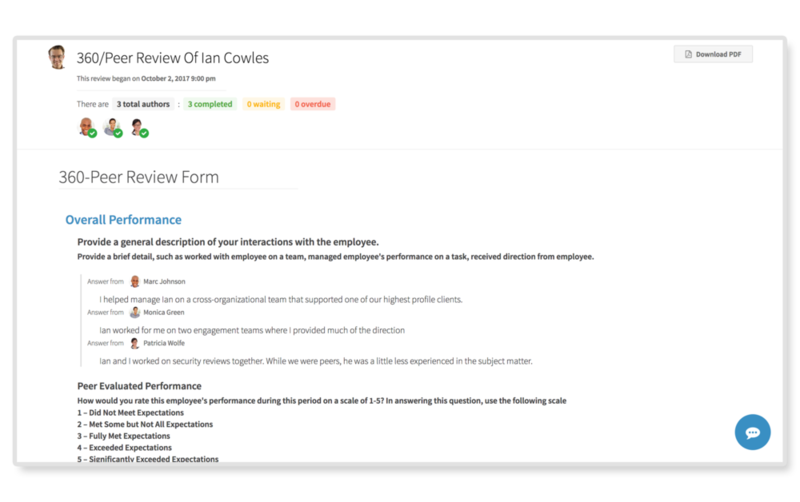 Dive into the results of your review processes, comparing employee performance through a variety of visuals and exports that enable the analysis that HR teams need. PerformYard reporting allows for simple calibration analysis so that top performers are identified and rewarded. Plot performance over time as a trend or compare employees in a nine-box.